When it comes to analysing future trends we all face a multitude of challenges. Economic data points ebb and flow continuously, requiring careful interpretation of underlying trends. On the surface economies shift like the wind, changing direction one minute, blowing strongly in one direction the next, and at times becalmed. The true underlying picture however tends to be less dramatic but this cannot be taken for granted; hence paying attention to what is happening around you is important. Political events and tensions add uncertainty into the mix making the task of interpreting events even more challenging. Politics can be both cause and effect whereby poor economic trends can sway political opinion and poor political judgements can influence economic outcomes, good and bad. In the first quarter this year, investors grappled with interpreting the actions of the new US President. Trump’s multiple and radical executive orders and his key initiatives of trade reform, tax cuts and infrastructure spending were all subject to intense scrutiny. We also had other notable events such as the Dutch election, the invoking of Article 50 and an increase in US interest rates. Looking ahead to the second quarter there are some key items on the horizon that will present challenges for those of us trying to make sense of world order. Trump – the US President will continue to fill news columns especially after today’s air strikes by the US on Syria. The world is starting to see how determined Trump is to accomplish his promises. However, investors will be searching for the detail on his economic policies. US interest rates – after a policy tightening through higher interest rates last month, further rate rises will be at the forefront of investors thinking. With two more hikes forecasted to take place this year expectations may shift toward yet more rises as higher wages, full employment and strong economic data encourage the US central bank to become more pre-emptive. French Presidential election – with the first round taking place on April 23rd, investors are watching the polls with some trepidation and scepticism; especially after the surprise of Brexit and Donald Trump. According to OpinionWay, Marine Le Pen continues to be the front runner, followed closely by Emmanuel Macron, but we know how “accurate” polls have been in the past. Brexit negotiations – are set to begin, with the European Union summit on April 29th being an anticipated foretaste of how negotiations may play out. It seems highly possible that heightened rhetoric played out via the media will be different to the quiet diplomacy underway behind the scenes. The obvious desire to find common ground, that benefits both parties in the negotiations, will be at the forefront of diplomats’ minds. ECB tapering – growing expectations that the ECB are closer to raising interest rates this year, with added attention that their bond-purchasing programme (i.e. Quantitative Easing) will be scaled back, are now being downplayed. The European economic recovery is growing and central bankers in Europe are very wary of the political backdrop and its potential to halt progress. For this reason, we expect that they will not take any actions that might risk derailing improvements underway. There are many events, political and economic, still to unfold and we will do our very best to keep you informed with the presenting evidence. 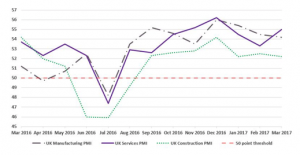 The UK Purchasing Managers Index (PMI) has again shown stronger figures than expected; an indication of resilience in the UK. 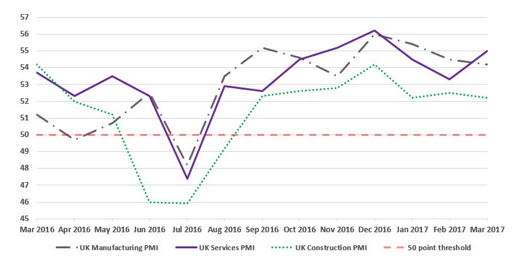 For those unfamiliar with the index, UK PMI utilises survey evidence across the Manufacturing, Construction and Services sectors. A reading greater than 50 predicts expansion and a reading less than 50 predicts contraction. As a leading, sentiment-based, indicator it is prone to swings in sentiment which mean its predictions should be treated accordingly. However, the readings are watched closely by all investors. The figures recently released show that sentiment remains positive overall. While Construction PMI and Manufacturing PMI readings declined slightly they are counter balanced by a stronger reading from the Service PMI. The services sector reading is driven by stronger growth in new business and robust domestic and improving global economic conditions. The services sector is particularly relevant to the overall economic outlook in the UK because it accounts for approximately 80% of GDP (the value of all goods and services in the UK). What we also observe is that strong PMI figures are similarly evident in Europe. 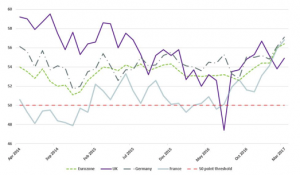 For example, France and Germany have higher PMI figures for March on the back of falling unemployment and continuing monetary stimulus with the ECB injecting cash into the European economy and keeping interest rates at 0%. Furthermore, a high Investor Confidence Index (at pre-2008 crisis levels) and a weak Euro add more stimulus to domestic investments and greater demand from abroad. In January 2016, global stocks tumbled into the new year amid worries about China’s slowing economy, rapidly falling oil prices and disappointing US corporate earnings growth. The MSCI China Index fell 12.3% in that month. This was in response to the Chinese government moving to intervene with its currency, aiming to weaken it, thereby helping their ability to export more goods abroad. 15 months on, China is about to step onto the world stage again. Today, the US President, Donald Trump will meet his Chinese counterpart, Xi Jinping. Discussions are likely to be centred on trade as Trump is determined to reduce the trade deficit that the US has with China. 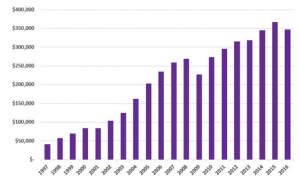 The bar chart below shows a whopping trade deficit created by an insatiable demand for Chinese low cost goods and services. In 2016, the US deficit with China accounted for approximately 70% of their overall trade deficit of $500bn. President Donald Trump has threatened harsh protectionist measures, such as a 45% tariff on Chinese imports but history shows this is not always an effective measure. Trump, through wise counsel from the US Treasury, will also be aware that China is the second largest holder of US government bonds making this an important problem to solve amicably!